It is that time of year again to start thinking about national park vacations and day trips into state parks. Last Thanksgiving I spent several days at the South Rim of the Grand Canyon (my 3rd trip to the big canyon) and currently am taking a 4 session evening weather class at Denver University. Although these two items seem unrelated, it immediately prompts me to think about taking precautions to avoid weather-related disasters when vacationing in national parks. National and state parks seem such peaceful benign places, but they do have rough unknown terrain and unexpected dangers. The obvious warnings about keeping a safe distance from wild animals are heeded by the vast majority of tourists. But weather related warnings are not always posted in the parks. 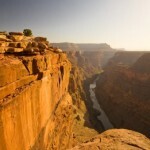 Do you know the leading cause of death in national parks? Most people would say bear attacks or a fall from a great height. It is drowning. Surprised? I was. There are many lakes in national and state parks. The rocky or sandy shores offer a chance for swimming but lifeguards are not present. Parents get preoccupied and lose sight of their child, sometimes resulting in a drowning. More common is drowning while out on a boat. Often these lakes are huge, such as Yellowstone Lake. Your trip can start out in calm water and suddenly the wind picks up, you are far from shore, and the rough waves, now several feet high, capsize your boat. Sometimes tourists do not wear lifejackets and cannot make it to shore. Floods are another common cause of disaster. Heed the signs and do not enter enclosed areas or arroyos (dry river beds) when skies are dark with rain clouds. If water enters your car, and you cannot back up, leave your car immediately. A car can be swept up in only 2 feet of water. Lightning can occur without warning. If you are on a mountain summit or hill top, get down from the rim immediately, if you see rainclouds or hear thunder. Do not take shelter under a tree. If you are in the path of a tornado and cannot get to a tornado shelter or to a safe area (basement) then abandon your car and lie flat in the nearest ditch (usually on the side of the road). If you have never been to a national park, please do not let these warnings scare you off. I have been traveling to national parks for 40 years with my kids, and by myself, and these grand-canyon2are wondrous places full of unexcelled beauty and delight. My two previous trips to the big daddy of canyons had been in the summer so it was an interesting contrast to visit the area in November and view the Grand Canyon with a dusting of snow. You definitely have to layer your clothing. We hiked down for about 90 minutes on a sunny cold clear day. The first 10 minutes of the Bright Angel Trail was muddy and a bit slippery, discouraging some potential hikers, but soon it was dry solid ground as the temperature warmed up – only 10 minutes into our hike. Remember one hour hiking down can mean two hours hiking up! The scenery and geology change with every twist and turn of the trail and the babble of foreign languages is nothing short of astounding. This time we stayed at the Yavapai Lodge, a short distance from the South Rim. 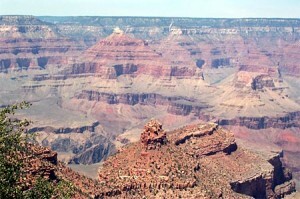 In previous visits we had stayed at Bright Angel Lodge (on the South Rim) and Grand Canyon Lodge (on the North Rim). The rim activity has built up tremendously in the 20 years since my first visit to the canyon. 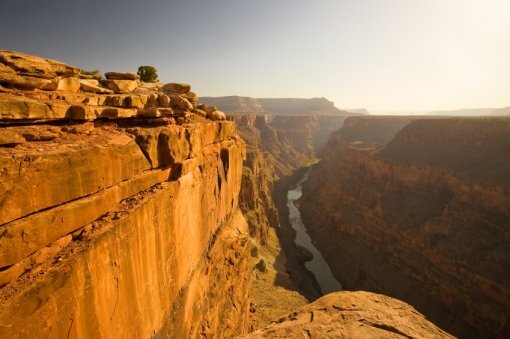 But the canyon itself is still a wonder, and once you start hiking down, you often have moments of complete solitude and silence and when you do encounter fellow hikers, it is a great chance to make new friends. Any place near or on the rim is a good place to stay. Your budget and the time that you book your hotel will determine your selection. Summer reservations should be made a year in advance for a full selection of dates and hotels. No matter where you stay, you should take a walk through the Bright Angel Lodge and visit the mini museum adjacent to the lobby. If your budget can take it, plan on having a dinner at the deluxe rustic El Tovar Lodge. It is a special treat, albeit an expensive one. You will need to make advance reservations. We had Thanksgiving dinner in their beautiful dining room and enjoyed the warm and cozy ambiance as much as the excellent meal. After that it was budget breakfast and lunch! I know I am repeating myself but when you are in a national park, make it a point to join in on at least one ranger guided hike or lecture. This time we chose a one hour lecture at the rim about the local condor population. We were not lucky enough to spot one during the lecture, but we became educated about how to scour the skies for them. Their distinctive huge wingspans make them unique among birds. Since we now live in Denver, we chose to drive to the Grand Canyon, about 12 hours each way, a pleasant two day drive with sightseeing along the way. We stopped at Winslow Crater (Winslow, Arizona) and the nearby Painted Desert/Petrified Forest National Park. The latter requires about 2 hours and offers some interesting short hikes. The entrance and exit for the Painted Desert NP are different and a bit tricky, so consult your map before approaching the area. Another interesting attraction near Interstate I40 is El Malpais National Monument, Geronimo’s former hide out. Once you see the place, you will know why. The terrain is easy to get lost in, and eerily beautiful. After an overnight stop in the Albuquerque area, we spent the morning in the Old Town of Albuquerque. This is a scaled down, less expensive version of the old section of Santa Fe and certainly worth a few hour’s visit. An absolute “must-do” is the Church Street Café located behind the church on a tiny street. The ambiance and the food made it one of the best breakfasts I have ever had. The restaurant is located in a beautiful hacienda, authentically decorated, with a wonderful menu selection – a great value for breakfast or lunch with lots of things to keep kids occupied. In my next installment I will write about my recent December trip to Brazil – Recife and the Brazilian Amazon and also my upcoming trip to Peru. I leave for Lima April 17 for a one week inspection trip of Cusco, Machu Picchu and the Peruvian side of Lake Titicaca. Until then – ¡Buen Viaje!